What souvenirs do you bring home? On my travels, I used to buy lots of trivial things: T-shirts, bookends, coffee mugs. Even shoes. Last year I decided to only take photos. And collect fridge magnets. Black moose - This is Sweden. For some reason, beginning with German tourists, moose have become the universal symbol of Sweden. We also bought at mug of moose dancing around a May Pole... at right! Chicago skyline - I went to my friend Sandy's wedding to the great Patrick. I love Chicago, it's vibrant, friendly, and you can walk around and feel the mobster vibe in the air. Try the Green Lounge for jazz and bullet holes still left in the panelling. Parisian tube sign - Picked up somewhere on the Ile de Paris, Saint Germain-de-Pres is nearby. Los Angeles California - From LAX waiting for my flight back home after my wedding. Eiffel Tower and balloon & Cabaret poster. Las Vegas city sign - Lauri and I married at Big Sur, but we got the papers done in Las Vegas the day before. It was a great day and a nice reminder. Big Sur California - Great image of redwoods on this magnet. Venice Beach - Venice Beach was our last stop on the way from Los Angeles. We both got tattoos and high-tailed it to the airport. 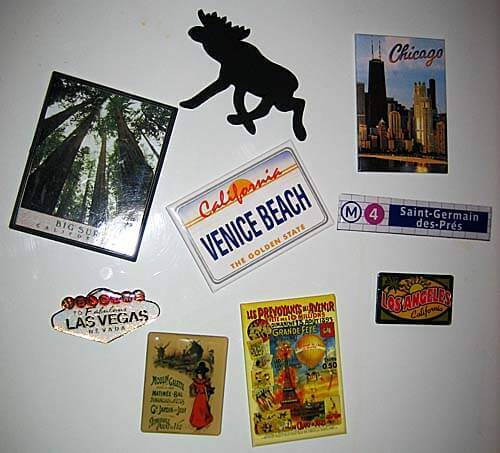 Fridge magnets are small, really cheap and are fun to display. With a whole refrigerator door full, small kids and curious guests can be entertained for a good long while! Sometimes, I make up tall stories around them. Though I'm never quite believed. After trying to cart books, shoes, clothes, mugs, art and so on back home (mostly broken by then) fridge magnets are the thing for me. Yes, I think fridge magnets rule. Every traveller brings something back home from their journeys. What's your thing? I traveled a lot when younger and mostly brought back rings.. From Hong Kong a multi color jade ring, Japan a pearl ring, Scotland a Topaz ring. I tried to get the stones that the country is known for. Altho as I have aged I have needed to resize them. Also I have brought home art work that I have on my walls as a constant reminder of the times there..